A very high quality men’s field lined up on the beach this morning at Playitas Resort for the half distance Challenge Fuerteventura. When you have a German trio of Boecherer, Bracht and Dreitz, alongside former Ironman World Champion Frederik Van Lierde (BEL) amongst others, the headline Brits including Will Clarke and Joe Skipper, were set for a tough day. Today I got hit by someone crossing the road at the last aid station during the bike course at 1/2 distance in Fuerteventura. An unfortunate accident while I was feeling strong from the start of the race. After the swim I could immediately break away, at 70 km my lead was over 4 minutes and I was ready to take the victory. It leaves me with a broken collarbone and a lot of motivation to work on my recovery. Starting with surgery tomorrow. With Van Lierde out, Henrik Hyldelund (DEN) took the lead and would reach T2 in first place, followed around three minutes later Boecherer, Bracht, Dreitz and Will Clarke, who was mixing it well with the German uber-bikers. The run was a close battle, as Hyldelund's lead was eroded by his chasers. Positions changed frequently, and at the midpoint of the run Dreitz was in front – but Boecherer and Clarke were still in contention. The Dreitz charge would fade over the final 10km, while Clarke was running strong to try and close the gap on Boecherer. It wasn’t quite enough and the German took a hard earned win, just 26 second ahead of the Brit, with Timo Bracht producing his trademark strong second half of the run to complete the podium, passing Dreitz. It really is great to see Will back in the sort of form which should provide a huge confidence boost for his prospects for the rest of 2016. Joe Skipper started today in confident mood, but will likely be disappointed to be going home with eighth, 12 minutes back at the finish. A 24:25 swim left him around three minutes in arrears of the pace-setters, when he’d be hoping for that gap to be closer to two. 26th overall out of the water, he moved up to eighth position at the start of the run thanks to his bike leg. Ten minutes behind Clarke at that stage, he held that position until the finish. Having had a great race already this year at Ironman New Zealand, and with a big summer target at Challenge Roth, he need not dwell on this one for too long. 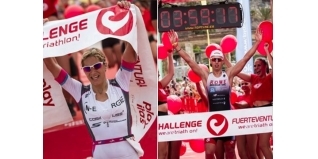 Given the depth of the men’s field, a start-list of just six female Pro’s is perhaps a little disappointing, especially given that there are no other Ironman 70.3 or Challenge events on the calendar this weekend. That however didn’t prevent a close finish at the front of the race. Great Britain’s Catherine Jameson was first out of the swim (22:50), with Anja Beranek (GER) and Emma Bilham (SUI) just under a minute in arrears. Eight and half minutes back, in by far her weakest discipline, former World Time Trial Champion Emma Pooley would have been glad to be back on dry land, with a challenging bike course ahead. Beranek soon took the lead on the bike, and would reach T2 in first place courtesy of a 2:40:17 bike split. Bilham (2:43:48) and Jameson (2:44:43) arrived next, three and half minutes back, while Pooley’s 2:46:25 didn’t gain her any time at all – she’d have to run hard to make the podium. By the halfway mark Bilham had reduced Beranek’s lead to around 90 seconds, while Pooley was cutting the deficit to Jameson – but still seven minutes behind in the battle of the Brits. While Bilham continued to close, Beranek took the win by a minute, while in the battle for third place, Pooley’s charge meant she was able to pass Jameson in the very final stages to complete the podium. 4th 2day @challengefv few ups & downs but gr8 race. Ill put more later.Thanks @PooleyEmma 4 overtaking me in the last 200m u owe me a drink! First British Age-Group athlete home as Ian Dempsey (16th overall, 4:25:42), who was first in the 35-39 category and fourth AG athlete overall. First British Age-Grouper (and also first AG athlete overall), was Ruth Purbrook (25-29, 5:00:58). Ruth crossed the line in seventh position.